As part of the the USA Science and Engineering Festival in Washington DC, October 23-24, I will be leading a mathematical “sculpture barn raising.” The sculpture is made from hundreds of laser-cut metal triangles, assembled in a novel manner to form a gyroid surface. Anyone can come to the booth of the American Mathematical Society and I’ll show you how to screw the triangular components together into this novel pattern. Here you can see how four of the metal triangles come together at each vertex. 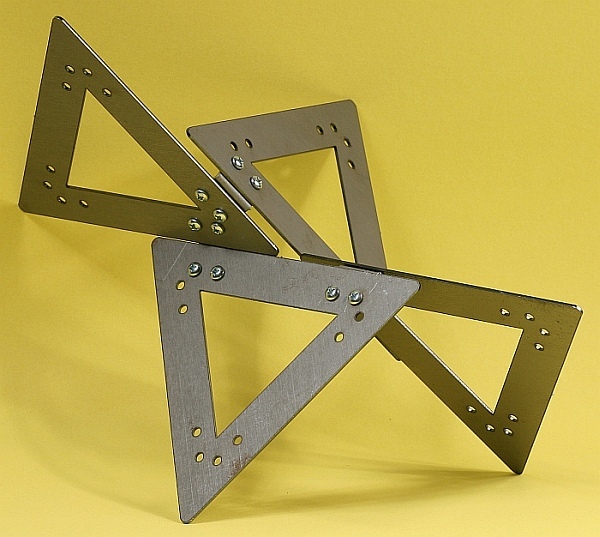 Small metal brackets align the parts at the correct dihedral angles. More information about this structure and the event are available here. In addition, the Festival will include Math Tours of the DC Mall area on Oct 22, given by the Museum of Mathematics. This article first appeared on Make: Online, September 13, 2010.